It has been an absolutely busy time in the bee yards. The weather has been lovely, the bees have been out, and it did not pour rain in the middle of the Maple and Cascara flows. Looks like good weather for blackberries too. It’s a very unusual year. A good year…but it has meant I’ve been building equipment like crazy. The nucs are doing great and established beehives growing taller. Too tall. I figure too tall is when I can no longer see into the top box and when I super a hive I have to reach above my head. 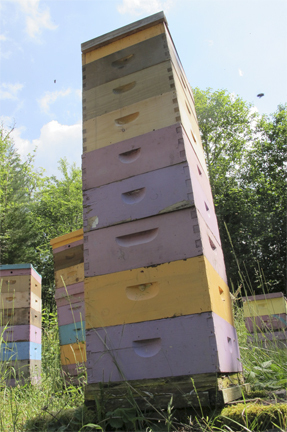 I’m 5 foot 7 inches (1.7 meters) – these hives are nearly as tall as I. 1) We had good weather. 2) I pull honey once a year, in the fall. This is for two reasons. a) Probably the most overwhelming is the traditional : I’ve always done it that way. b) The second reason is that normally it rains during a significant part of the honey flow, so the bees gather nectar on dry days, then hang out inside make and eat honey on wet days, then it all repeats. In this latter case, the honey stores don’t build up to these towering heights. They are called Walk-Away because you walk-away for three days at the end of the procedure. You can make two hives, three, or four hives out of your tall hive – it depends on what you want, and what’s in the hive. I divide each tall hive in half. 3) Divide the boxes between the two up-turned tops. c) The pollen box (usually my bottom box) I do divide this up between the two hives. I move the pollen frames to the outside positions on either side of brood. 5) Collars and tops on the top. In three, sometimes four, days I come back and go though the hives. I’m looking for eggs. The hive that has the eggs has the queen. I don’t look for the queen. A good hive should be getting their queen out of my way as fast as possible. The queenless hive (that with no eggs) is then either given a queen, or a nuc with a queen (newspaper combine method), or a frame of eggs from a hive whose queen I like. Best is the queen option, but things don’t always work out in beekeeping. That’s it: just break the hive into two hives. Divide up the honey, brood, and pollen. Leave them for 3 days. Then find the queenless (egg-less hive) and give it a queen or some eggs. This does reduce the honey harvest. But I can’t harvest honey if I can’t get the super up there or lift it down. I could pull honey twice a year, this year, but habits die hard. If this weather is going to be the new “normal” I just might do a small honey harvest in June. That’s what’s happening at Brookfield Farm Bees And Honey these days. Still making new bottom screens, tops, collars, frames, and hanging wax for the bees. Markets are going strong and the festival season’s coming up fast. We’re at the Ballard Farmers Market and Seattle’s Fremont Market every Sunday. A list of the festivals we’re doing can be found at the Brookfield Farm Markets & Events page (which needs more added – oh dear, I’m behind on the web again). Molly and her kids were at the hives when I was taking the pictures. So here’s the most recent additions to Brookfield Farm’s landscape team, and their mom. That’s Marie Marie, The Bopper, and their mom Good Golly Miss Molly. 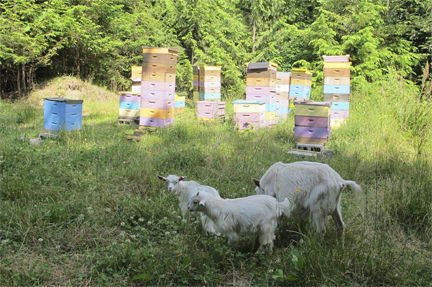 This entry was posted in Beekeeping, Brookfield Farm Bee Yards, Hive Components and tagged away, beehive, Beekeeping, bees, Brookfield Farm, how to, Maple Falls, splits, walk, Washington. Bookmark the permalink.